I believe that we live in an age where fallen-away Catholics don’t really know what they’ve left, non-Catholics don’t really know what they’re missing, and many Catholics don’t really know what they’ve got. They don’t really know the Mass. The Mass is the climactic form of Christian worship and within it is contained the greatest miracle on earth. It is a mystery in the fullest sense, and yet, it is comprehensible. As Christians we possess faith, but do we possess understanding? Do we even seek it? I know personally that my understanding of the Mass and what happens during it is inexcusably deficient, mostly from neglect. But I (and you) can change this — and it begins here. I want to help change your next Mass experience, by the grace of God. So I’ve compiled a list of 7 interesting facts about the Mass, each with a brief explanation. I hope you learn something new! The Sign of the Cross that marks the beginning and end of the Holy Mass, and which signifies the sealing of the Word of God “in our minds, on our lips and in our hearts” at the reading of the Gospel, has its origin in the first centuries of Christianity. “In all our travels and movements, in all our coming in and going out, in putting on our shoes, at the bath, at the table, in lighting our candles, in lying down, in sitting down, whatever employment occupies us, we mark our foreheads with the sign of the cross” (De corona, 30). The sign of the cross, done by faith, has immense power. St. Benedict once did the sign of the cross over a poisoned drink meant to kill him, and as his hand moved reverently through the four directions of the cross, the glass shattered. What would have happened if he had been insincere, or worse, not blessed his food and drink at all with the sacred sign? God only knows. Each sign of the cross is also a sign —a renewal even — of one’s personal decision to accept Christ as Lord and Savior. How many times have we gone through the “motion of the cross” instead of the “sign of the cross”? When the Christian people respond “and with your spirit” to the priest’s greeting (“The Lord be with you”) in the Holy Mass, it is not just a polite (and somewhat odd) response. It is a profession of faith in the power of the Sacrament of Holy Orders. It recognizes the unique action of the Holy Spirit in the ordained priest, particularly in the Sacraments. Remember, for example, it is not the priest who changes the bread and wine into the body and blood of Christ — it is Jesus Christ. Thus, the priest receives the power to serve as a special instrument of the Holy Spirit at his ordination; that is, when he receives the Sacrament of Holy Orders through the “laying on of hands” (see 1 Tim 4:14; 2 Tim 1:6). The priest kisses the altar in veneration, recognizing it as the sacred place where Christ’s once and for all sacrifice will be made present in the Sacrament of the Eucharist. Jesus’s death is re-presented in the Holy Mass as a celebration of the New Covenant Passover, just as the Old Covenant Passover was made present each year it was celebrated (see Ex 12:27). St. Paul contrasts the Eucharistic sacrifice to the pagan sacrifice in 1 Cor 11. Jesus is therefore not re-sacrificed at each Mass but rather, His one sacrifice becomes present to us as He is eternally presenting Himself to God as the sacrificial Lamb of God (Heb 7:25; 1 Cor 5:7; 1 Cor 11:26; Rev 5:6). “Assemble on the Lord’s day, and break bread and offer the Eucharist; but first make confession of your faults, so that your sacrifice may be a pure one. Anyone who has a difference with his fellow is not to take part with you until he has been reconciled, so as to avoid any profanation of your sacrifice [Matt. 5:23–24]. For this is the offering of which the Lord has said, ‘Everywhere and always bring me a sacrifice that is undefiled, for I am a great king, says the Lord, and my name is the wonder of nations’ [Mal. 1:11, 14]” (Didache 14 [A.D. 70]). 4. What’s Inside the Altar? Did you know that many Catholic altars have a relic placed inside? For more, I also discuss relics in this recent article. The crucifix, properly understood, is not an image of a mere gory execution; rather, it is a sign of the once for all sacrifice of the Lamb of God (1 Cor 5:7). There is also to be a cross, with the figure of Christ crucified upon it, either on the altar or near it, where it is clearly visible to the assembled congregation. It is appropriate that such a cross, which calls to mind for the faithful the saving Passion of the Lord, remain near the altar even outside of liturgical celebrations (GIRM 308). The venerable practice of genuflecting before the Blessed Sacrament, whether enclosed in the tabernacle or publicly exposed, as a sign of adoration, is to be maintained. This act requires that it be performed in a recollected way. In order that the heart may bow before God in profound reverence, the genuflection must be neither hurried nor careless (Inaestimabile Donum 26). Some people may wonder what’s up with Catholics and all the bowing, standing, sitting, kneeling that they do in the Mass. It’s a good and honest question. 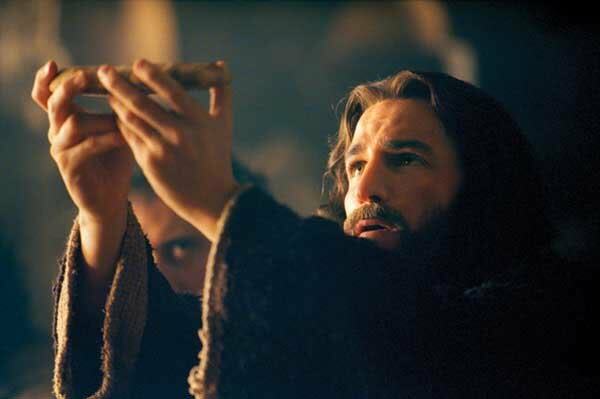 Catholics assume these gestures because of who and what they are encountering in the Mass — the King of Kings and His Word. In the case of veneration with the body, the body leads the heart. “At the very least, they can be persuaded that the bodily position makes no difference to their prayers; for they constantly forget, what you must always remember, that they are animals and that whatever their bodies do affects their souls” (Letter IV). First, it is not a separating of Christ, as though a “part” of Christ is here and a “part” of Christ is there. In each molecule of the consecrated host, the resurrected Christ is totally and perfectly present in His infinite divine substance. Second, this “breaking”, called the “Fraction Rite”, follows Christ’s breaking of bread at the Last Supper and is rich in biblical significance (Luke 22:19; Acts 2:42, 46; 1 Cor 10:16). Third, the commingling of the broken fraction with the blood in the chalice symbolizes the reunification of Christ’s body and blood in his glorious resurrection. Originally, this Fraction rite and commingling had another important significance. At each Mass, the priest would break off a piece of the host (as he does now) but then, that consecrated fraction would be sent to another celebration of the Eucharist at another location. There, the fraction sent from the parish “down the road” would be commingled with the blood of Christ. The fraction of the host from that Mass would then be sent off to another Mass, and so on. This ritual created a great sense of unity among the faithful in the Mass, and signified the continuity of the eucharistic sacrifice in the Church (Mal 1:11; 1 Cor 10:17). This practice was known as fermentum, but has fallen out of practice in modern times. If you would like to read more about the specifics of the Mass I highly recommend Mass Revision by Jimmy Akin to get you started. Previous Post The Assumption of Mary: Is It Reasonable To Believe? Very good article. It does give you a pretty good exclamation of mass. I am a new converted Catholic and it is pretty good.